The TV7 Pawvac is great for storing approximately 4 lbs of cat and dog food. The Breadvac’s wide mouth (8.5”) design makes it a fantastic container for larger Barkery treats. 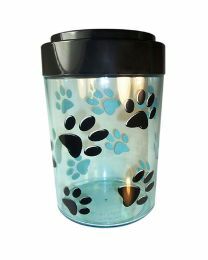 Perfect for open cans of pet food, not only will the ODORS be contained, it will also remain fresh until you are finished using it. Travel friendly with larger amounts of bird seed, hamsters, reptiles and all small critters food. Our Vacs prevent MITES from multiplying, bug invasions from starting and keeps your valuable pets safe from infections, so common from foods that contain pest larvae. Keeps dry goods up to 1 year and beyond! Simply the best container for RV’s & travel, camping, boating, cottages and second homes. Store any Pawvac conveniently on the countertop, in the pantry, the fridge or freezer. Our Vacs save you money and guarantee fresher for longer food storage. IAMS Proactive Health Dry Cat Food 1 bag/2 lb. KAYTEE Cockatiel, Parrot Diet Food 1bag/4 lb. IMAS Mini Chunks for Dogs 1bag/4lb. Beneful Purina Dry Dog Food 1bag/3 lb. Fancy Feast Gourmet Cat Food 1bag/48 oz. The Breadvac patented system is able to preserve goods for 1 year and beyond by allowing products to breath and degas. Almost all food goods are smell proof inside the Vacs , however some products like freshly roasted coffee and medical herbs may degas, leaking there odor. Our 2 way valve allows gas build up to slowly escape – without letting oxygen in. This is one of the main reasons it can preserve goods for long periods of time. Is the TV7 Pawvac patented system easy to use? How does it work? Note: When TV7 are new – Caps are loose and will get tighter fitting as the container is used. If you are carrying heavier items such as 2.5 pounds of coffee we suggest using a piece of tape to hold the cap in the locked position. Over time and prolonged use the cap will become tight fitting. Looser caps function exactly the same as tight ones – meaning the seal is not compromised.